When you think of landscaping your yard, does your mind automatically think of heading to the nursery to find new plants? If so, you might be missing the opportunity to make use of inanimate objects such as rocks, pavers or even driftwood. Consider the natural world—when you’re on a hike, sitting by a lake, or wandering past a stream, a natural landscape is a meandering array of plant-life as well as boulders or stones. Here at Levy’s Lawns and Landscaping, we enjoy creating beautiful hardscaped landscaping, integrated with the rest of your yard. A downward slope in a typical Pacific Northwest yard provides the perfect foundation for a sprawling masterpiece. Big boulders surrounded by plants with a few smaller rocks on the side looks fabulous. Or, add a dry creek bed lined with grasses and rushes. A few stone or ceramic salmon heading down the stream adds a touch of whimsy in keeping with the Northwest vibe. 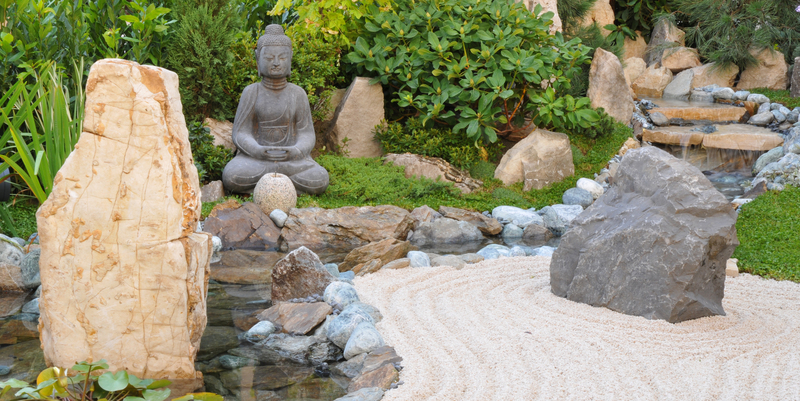 A true Zen garden consists of rocks surrounded by gravel. The gravel is raked into a ripple effect, resulting in a calming backyard oasis in which to escape your hectic life. Pavers come in a variety of forms, including brick, brick-like concrete or even stone such as Travertine, Limestone, Bluestone, Basalt, Sandstone and Granite. Lay down landscaping cloth to create a barrier between the soil and the new base of sand you’ll spread. This will keep weeds to a minimum. Then, add a winding path made of pavers. Surround the pavers with large, smooth stones or pea gravel. Add some color and texture with plants and you have one easy care, low-maintenance yard. Using landscaping cloth as mentioned above, build a patio with pavers, bricks or stones. Surround the entire structure with low growing plants and you have a private hideaway for entertaining, hanging out or simply relaxing. Ever walked a labyrinth? A labyrinth or maze can be simple or elaborate. It can serve as a meditative practice or a work of art. With proper planning and materials, you can add a labyrinth on your property and create your own meditative pathway, or, at the very least, a beautiful design to delight the eyes. While your pavers might be square or rectangular, the placement in your yard is limited only by your imagination. Try placing them in a circular pattern. Or, an elaborate S-shaped curve flowing around ferns. The only limitation is the size of your yard. Don’t want to do the heavy lifting a hardscaped yard requires? Give us a call at (360) 265-5231. We’ve got the right equipment to excavate, lift and place your hardscape pieces. How Much Fertilizer Do I Apply to my Lawn?